You need current imagery and you need it now. I hear this all the time from people with diverse use cases from “I want to see my house” to “we are responding to a communicable disease outbreak” to “I need a monthly count of shipping containers at a harbor.” Not a big deal—just point the satellite and shoot, right? No. Maximizing imagery availability in YOUR area of interest (AOI) is complex, requiring integration of processes and technologies that are global in scope but local in execution. This blog series deconstructs maximizing image availability into its core elements so you understand the power of DigitalGlobe’s industry-leading constellation, our collection strategy and the resources and tools with which we tackle the issue. It all starts with a strategy and a plan…so today’s blog focuses on new collection strategies. At high level, our strategy to maximize image availability in your AOI is simple: Collect imagery of every place on the globe at the right time to meet our customers’ needs for current, high-quality imagery in their particular AOIs. But as we execute this strategy, it gets complicated. We start by considering a number of factors. Foremost, we listen to customer input on where demand for imagery exists. Then, we look at multiple data sources to anticipate market needs for where imagery will be required in the future. For example, the demand for updated imagery over a city could be more frequent than demand over surrounding rural areas. But wait! It isn’t always that simple. For example, a major highway running through a rural area may require updates more frequently than other rural areas. Take this simple model and apply it globally for use cases covering location based services, urban planning, energy, agriculture, mining and others, and that’s the breadth of input we use to determine our collection strategy, our baseline global mapping content plan. 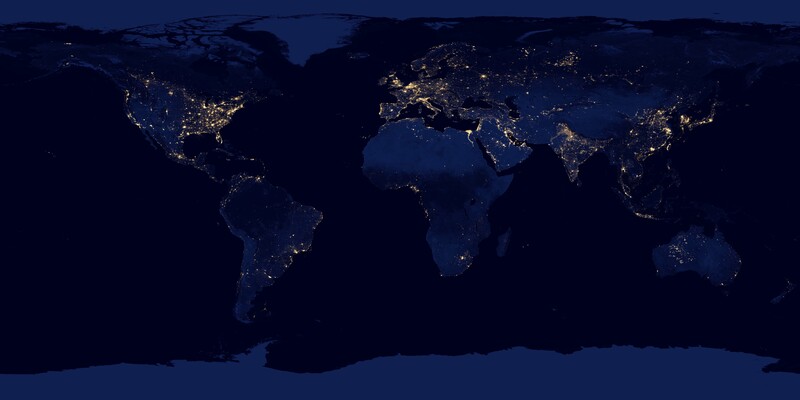 To visualize our content strategy, look at the NASA Earth at Night image – the more lights you see, most likely, the higher the refresh priority in our global content plan. Because the world we live in is so dynamic, our global content plan is never perfectly balanced with our customer’s direct imagery needs and future market expectations. We receive requests frequently for new collections of specific areas at specific times for specific customer use cases, which could be imagery to support the design/build activity of a new gas pipeline, a large forest health study, or to count cars in a parking lot. Globally, thousands of unique collection requests overlay our baseline global content plan, and this is one more instance when we adjust our plan to fulfill these requests. Then, the unpredictable happens—a natural disaster or accident—and imagery is needed immediately to support first responders for search and rescue efforts. When disasters occur and lives are at risk, the need to collect imagery of the impacted area goes to the top of the list, and quickly. This is one more instance when the plan is adjusted to work an urgent collection need into ongoing collection requirements. Balancing a global content plan with customer needs would be relatively simple if we had to do it for your AOI only. But that’s not how it works. We execute the strategy for thousands of AOIs, on a global scale, 24 hours a day, 365 days a year. We also have to navigate clouds, seasonality and weather. It’s complex. Our global content plan is living, breathing, and changing as is the world in which we live. And when landscapes change, events occur or opportunity arises, we adjust our plan accordingly and efficiently to provide our customers with what they need. Check out part 2 of our Maximizing Image Availability blog series, which discusses a new and exciting addition to our imagery toolkit: DigitalGlobe Atmospheric Compensation (AComp). Learn more about how we maximize image availability here.